The past few weeks have been a flurry of planning and excitement for the P4 crew. Immediately following our successful event at MoCNA we transitioned to planning for our first style + fashion mixer on a reservation – our rez, the Navajo Nation. 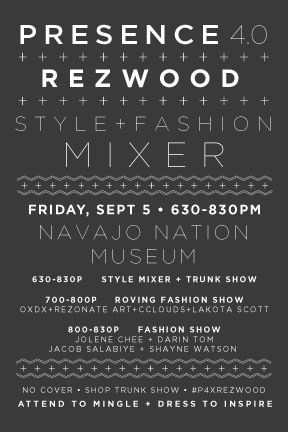 We partnered with the Navajo Nation Museum coordinating the fashion component of the REZWOOD festival. A film, music and fashion festival, REZWOOD was a convergence of Navajo/Native creativity with activity spanning three days. It was an honor to be a part of the inaugural event especially because it was our first chance to bring our passion for Native style and fashion to our homeland, something we had long desired to do. Our style mixer included a fashion show sharing the fashionable artistic designs of Rezonate Art, Lakota Scott, Jeff Slim, OXDX Clothing, Notabove Jewelry and CClouds. Our runway show involved the lines of Jolene Chee, Darin Tom, Jacob Salabiye and Shayne Watson. Each look was stunning and beautifully donned by our fly models. Throughout the evening the Navajo Nation Museum’s entry way was brimming with community members in Window Rock for the Navajo Nation Fair. Visitors spent their time shopping the looks of the artists and designers in the trunk show. A special thanks to Rezonate Art, Notabove Jewelry, Lakota Scott & Jeff Slim and Salina Bookshelf for their contribution of stellar door prizes. To all who attended, ahé’hee’. To our partner the Navajo Nation Museum it was an honor to be a part of something so fresh & innovative in Diné Bikeyáh.